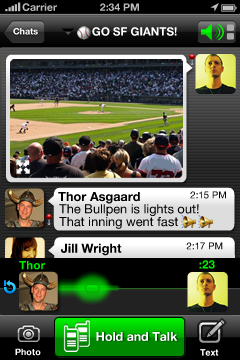 Back in late November I wrote about a walkie-talkie mobile app called Voxer that had looked like it was starting to break into the big leagues of mobile communication. Since then, it has, at various points passing a few competing walkie-talkie app startups… and also Facebook, Skype, and most other mobiles apps for that matter, on both iOS and Android. It’s been among the top three top apps in the social networking category on both iOS and Android over the past month and a half or so here in the US. That’s included the #1 spot on iOS for 25 of those days and #1 on Android for 22 of them. It’s also regularly been in the top 25 overall in the app stores, only getting temporarily displaced by a rash of heavily marketed games for a few days here and there over the holidays. What’s driving all the new growth and usage? People who want the walkie-talkie social experience like what Nextel phones used to offer, where you push a button on the interface to stream a quick message to a friend or group. Because you’re basically just recording short clips of yourself, other people can go back and listen to the recordings later on if they’re in the middle of something else. Think of it as the voice version of text messages, in a way that won’t cost you minutes on your phone plan. The app appears to have first taken off with young people in black communities in Cleveland and other US cities, with other users around the world hearing about it and joining since then. It’s been getting a few media hits — celebrities like Soulja Boy and Kevin Durant have talked about it, and passionate users have written songs about it. CNN also aired a segment on it a few days ago, where the cable news serviced interviewed founder Tom Katis about how the app came out of his experiences as a special forces communication specialist in Afghanistan — he needed a better way to help people communicate in the heat of battle. Voxer has since gone global, and is currently among the top 25 social networking apps in more than 60 markets, according to app tracking service App Annie. On the backend, infrastructure service providers Joyent and Basho Technologies have also been working to support the growth, with the latter recently issuing a press release bragging about how it has helped Voxer scale up using the open-source Riak database. The app is currently free but the plan is to add some premium features at some point. You can download it for iOS here and for Android here.